Our collection of Fly Drive holidays offers the perfect combination of flexibility to explore Swedish Lapland at your own pace, with the benefit of following a well-researched route and having pre-booked accommodation at the end of each day. Icehotel - Asaf kliger. Elephant in the Room by AnnaSofia Mååg. This unique Swedish Lapland Fly Drive package highlights Scandinavian architecture, arts, culture and design. You will bring a visit to the ICEHOTEL the first hotel made from ice and snow. And by the Treehotel you will spent the night in one of the 7 unique designs room. By arrival in Luleå you will stay in one of the newest hotels in the city centre, featuring unique photo art and seasonally inspired designs. The restaurant and sky bar are located on the 9th floor offering a panoramic view over Luleå. 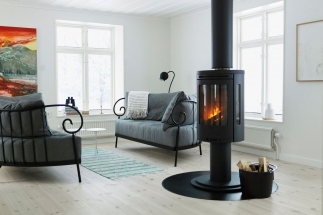 Relax and enjoy the simplicity of an arctic village life during your stay by the beautiful Arthotel Tornedalen situated along the Torne River banks looking across Finland! The Fly Drive route starts in Luleå, and continues to the UNESCO World Heritage site Gammelstad, the best preserved church town from Sweden. Gammelstad is located about 10 km more inland then Luleå and it’s the districts’s main cultural symbol and worth a visit. From there the route continues over the Finnish border, where you can visit both the Museum of Tornedalen and the Aine Art Museum. Following the Torne river stream upwards you will pass the Arctic Circle and arrive in the village of Jukkasjärvi where the ICEHOTEL is located. In Swedish Lapland the tradition and culture from the Sámi people are still very much alive. 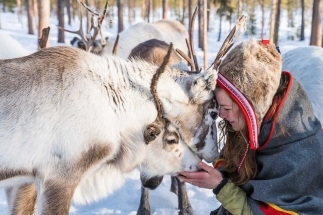 Reindeer herding is central to Sámi culture, but recent years also new ventures emerge in tourism, music, craft and design and the sale of traditional delicacies. You can learn and discover more of the Sámi culture close to the ICEHOTEL by Nutti Sámi Siida or by visiting the Ájtte museum in Jokkmokk before arriving at your next destination the Treehotel. By the end of this 5-day Fly Drive holiday, you know in a nutshell how inspiring and powerful Scandinavian Design is integrated with its culture and nature. Rental car, Hertz standard; Volvo V60 or similar. Navigation, unlimited kilometers, extra driver, supercover excess elimination. Arrival to Luleå, the capital of the northernmost county of Sweden, Norrbotten. Day 1 Luleå, the capital of the Northernmost county of Sweden – Norrbotten. Arrival at Luleå airport, our local guide will welcome you and will assit you with getting your rental car at the airport. During the short drive to your hotel you already get a good impression of the remarkable Luleå River as you cross the bridge connecting Luleå with the southern mainland. The hotel for tonight is illustrated by prominent photographers and lighting designers. You can relax in the spa or do a drink at the Skybar, located at the 9th floor of your hotel with the best view in town. Today you start driving in the direction of the UNESCO World Heritage site Gammelstad (10km). Gammelstad is the best preserved church town from Sweden. Here you can walk through the labyrinth of narrow streets in between the more than 400 charming and red coloured cottages. Most of the church town is still in the same style as a few hundred years ago. The route continues to Tornio(135km) just over the border to Finland. Where you have the option to visit both the Museum of Tornedalen and the Aine Art Museum. 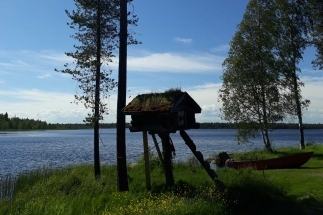 Today you will cross the border once more as the route continues on the Swedish site, where you can visit the cultural fishing village Kukkolafors. 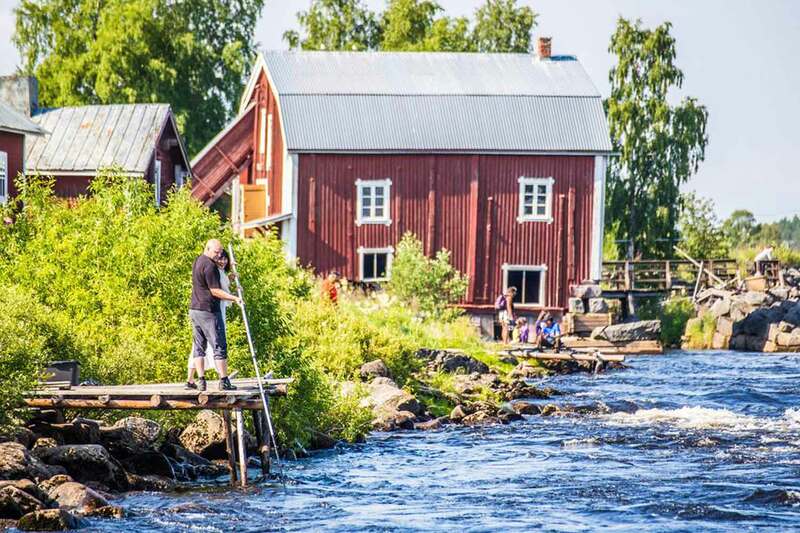 This picturesque village is located alongside the Torne river which forms the border between Sweden and Finland. From here it’s just a short drive to Arthotel Tornedalen. Your destination for today is adorned with arts and crafts, and uplifted by the beautiful countryside surrounding the houses. 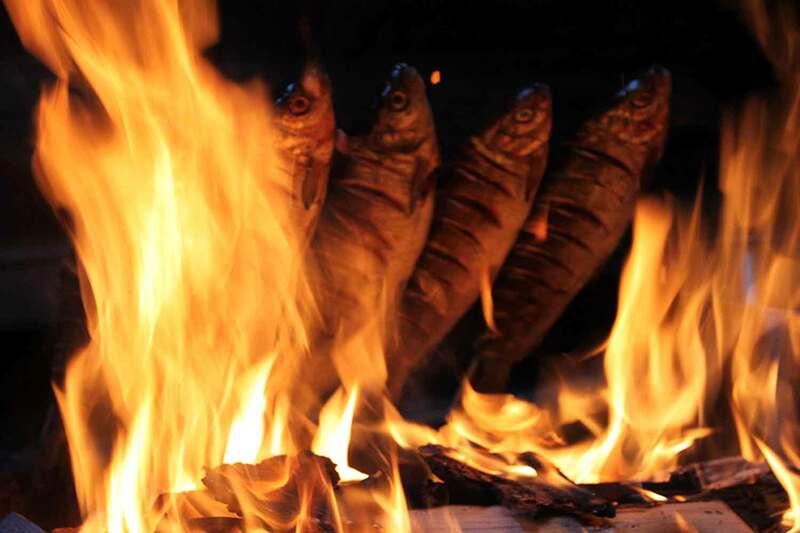 A private chef prepares your 3-course dinner from scratch on site, using local products such as berries from the forest combined with meat and fish from the region. After breakfast the route continues driving North alongside the Torne River. With its impressive length of 520km, Torne River runs from the ancient mountains in the west down to the coast in the east, where it flows out into the sea. At Juoksengi you will pass the Arctic Circle and drive into the land of the Midnight Sun. 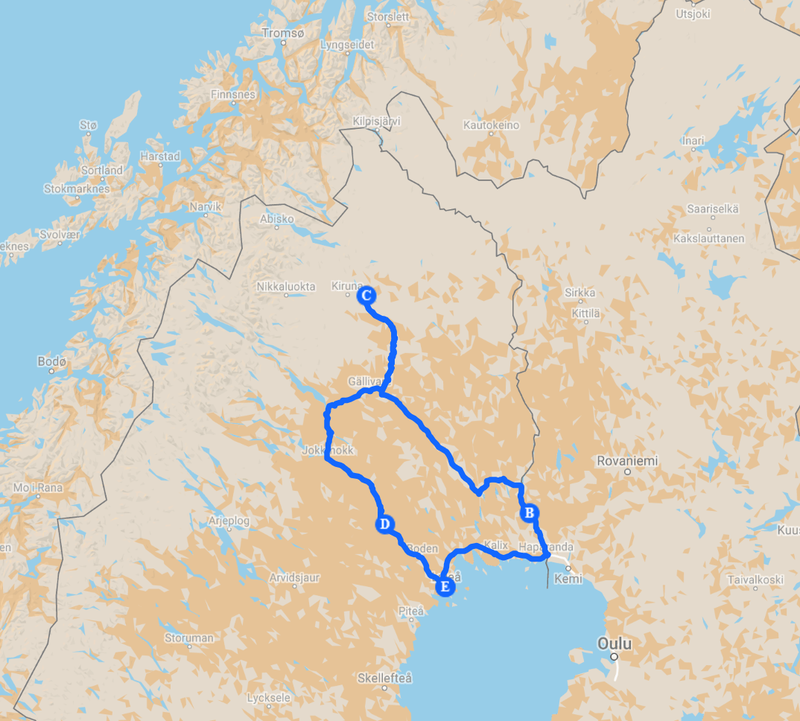 After about 160km you will leave the Finnish border and continue driving more inland’s, still following the Torne River to the village of Jukkasjärvi to ICEHOTEL, 200km north of the Arctic Circle. 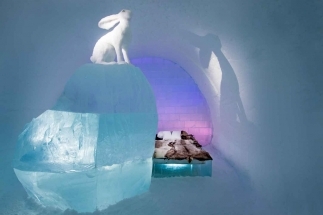 The ICEHOTEL is the first hotel made of ice and snow, founded in 1989. Here you stay tonight in a warm hotel room, but if you want to stay in one of the unique design cold rooms inside the ICEHOTEL we can adjust the program to your wishes. The cold rooms have never been created before. Every room is individually themed and hand carved by artists commissioned from around the world. The rooms hold a temperature of -5 to -8 degrees celsius. The bed is covered with reindeer hides and on top of this, you sleep in a thermal sleeping bag. 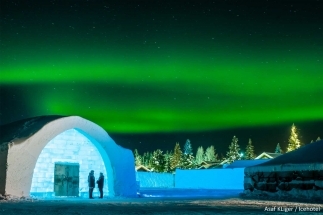 Spending a night in the ICEHOTEL is a surreal experience and a memory for life. 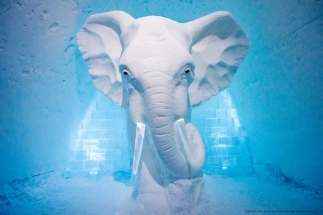 Thanks to the new concept ICEHOTEL 365, the frozen rooms are available all year round. Heading south, to the mythical place of Jokkmokk, a natural meeting place for Sámi people and a centre for Sámi culture. 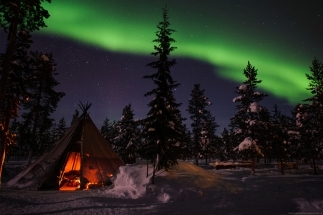 For more than 400 hundred years, the colourful Jokkmokk winter market has been celebrated annually. But even outside of market time, Jokkmokk is one of the best places in Swedish Lapland to experience traditional Sámi arts and crafts. Much of what you will find in the town’s shops and galleries is locally made, using natural materials, from local wood to reindeer horns and many products reflect the way Sámi people used to live their lives. Bring a visit to one of the local craft shops or learn more about the Sámi culture in the Ájtte Museum, the best place to learn about Sámi history and culture. 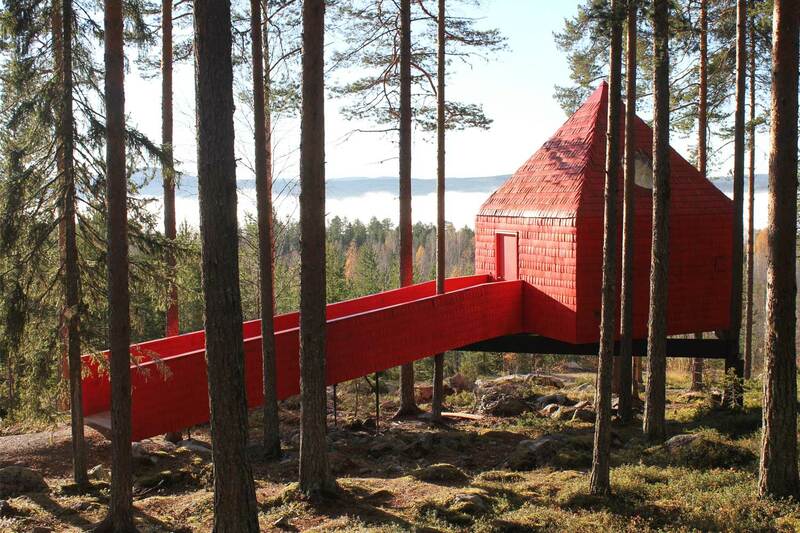 Your next stop will be at the Treehotel, where you will stay in one of the 7 design rooms of the world famous Treehotel. 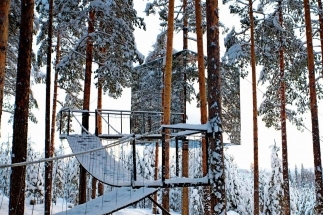 The Treehotel offers you a unique hotel experience: tree rooms with contemporary design in the middle of unspoiled nature. From the Treehotels rooms you get a fantastic view of the Luleå River valley, miles of forest and the powerful Luleå River. In the evening dinner is served at the restaurant, which offers delicacies from the region and traditional Swedish dishes. Today is the last day of your holiday and after your breakfast, the day is depending on the schedule of your return flight. Maybe you have some time left to relax or visit the regional art gallery in Boden. Havremagasinet exhibits local art with cultural and historical connection. But if you have an early flight then it’s time to get ready. and checkout of your hotel room. Drive to Luleå and return your rental car at the airport prior to your return flight. The itinerary is a guide for you. We can customise this further, based on your interests and wishes. If you would like to make any changes to your itinerary, just let us know and we will work together with you to tailor the holiday to match your requirements. Moose is the largest of all the deer species. They reach 170 – 210 cm height at shoulder. Bulls weigh weigh 380 – 850 kg and cows weigh 200 – 360 kg. 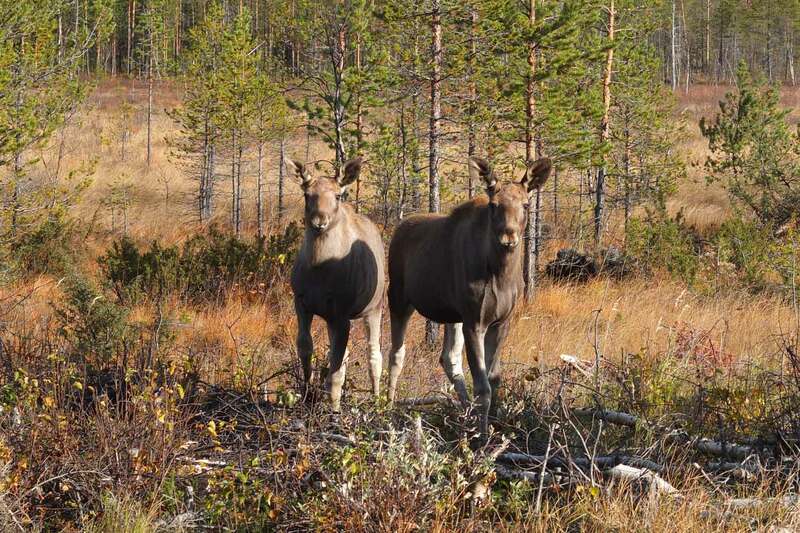 Moose are solitary and do not live in families or herds. The calves follow the cow during one year. Their diet consists of both terrestrial and aquatic vegetation. During Summer when food is plentiful they typically feed on herbs and leaves. During Winter they survive on shrubs and buds from Pine trees. The bright dancing lights of the Northern Lights are collisions between electrically charged particles from the sun that enter the earth’s atmosphere. The lights are seen above the magnetic poles of the northern and southern hemispheres. Northern Lights appear in many colours and forms. Winter in the north is a good season to view the lights. The long periods of darkness and the frequency of clear nights provide many good opportunities to watch the Northern Lights. Gammelstad Church Town is a UNESCO Word Heritage Site near the city of Luleå. It’s a type of town that was once widespread throughout northern Scandinavia. It is home to a unique cultural environment. 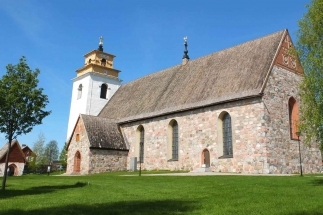 Here you can find the largest late medieval stone church in Northern Sweden, from 1492 and the largest and most well-preserved church town in Sweden with more than 400 church cottages. Gammelstad was listed as a World Heritage Site in 1996. The Husky; smart, friendly and born to run. As soon as they notice you, the dogs are enthusiastic and all eager to go. Going on a dog sledding tour in Swedish Lapland is an unique experience in many ways. The strength of the dogs and their capability to pull the sled at high speed in the snow covered terrain, the crisp climate and stunning surroundings will give you a thrill never to be forgotten. You have chosen FLY DRIVE - Scandinavian Design. To continue your booking, select your arrival date. Thank you for your request --> please finish!